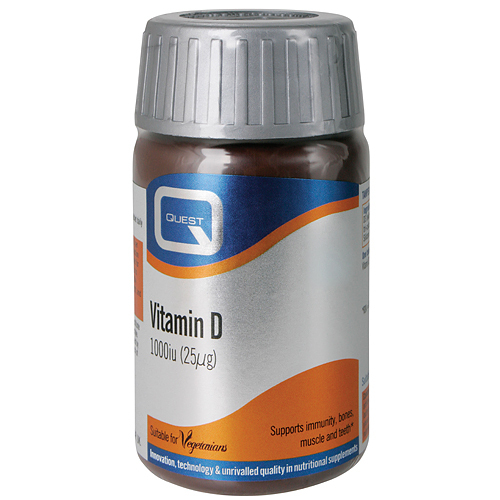 Quest Vitamin D provides 1000iu of Vitamin D3 per tablet. 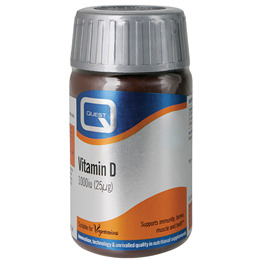 Vitamin D contributes to the normal function of the immune system and muscles. It is needed for the utilisation of calcium in the body and may help to maintain healthy bones and teeth. Vitamin D is naturally created by the body through its exposure to sunlight and may be recommended as a supplement for individuals with limited exposure to sunlight. Microcrystalline Cellulose, Di-Calcium Phosphate, Vitamin D3 (with Arabic Gum, Antioxidant; d-a-Tocopherol (from soya), Tri-Calcium Phosphate), Magnesium Stearate, Anti-caking Agent: Silicon Dioxide. As a food supplement take 1 tablet daily with food. Swallow with water. Do no exceed the stated intake unless instructed by a qualified health professional. Below are reviews of Vitamin D 1000iu - Immunity & Bone Support - 180 Tablets - Best before date is 30th June 2019 by bodykind customers. If you have tried this product we'd love to hear what you think so please leave a review. An excellent protection for skin & bones.